Well, that I did not see coming. If they were seriously looking for a non-striking rubbish striker they could have had one or two of ours! What a waste of money! With all due respect, but are you serious? Just look at his scoring record. Even during his "bad phases" he scored regularly. Super transfer. I was never a big fan of Gomez over the years, but if used correctly, he can still score quite a few due to his killer instinct. Hope he finds his form again in Stuttgart. I see no downside to this, great move for Stuttgart and Gomez. Does this mean its time for the triumphant return of the button!?!? The answer is yes, yes it is. Sorry to be negative, but the fact that he is still moving about from club to club and not scoring any goals says it all really. I hope I am wrong, but older players with good reputations seem never to realise when to stop! (Klaas a good example - his last year was sad!) Di Santo has gone, Szalai went a long time ago and there are others who have lost the initial burst of energy and speed and cannot keep up with the game anymore. (Eintracht?) Please add as you think of them - there are still lts around! Not scoring any goals? 17 goals last season for Wolfsburg, 26 goals for Besiktas a year before. Spent most of the time injured in Florence before that, and I think his Bundesliga record is indisputable. Not scoring any goals? You might be thinking of a different Gomez. I never deny actual figures and any striker would love those. However - particularly at Bayern- I would like to see how many were scored from cheating and lying and pretending to fall over in the box - only Marco Marin did it better in those days and the Italians were ready for him (7) Now we have a young group of refs and they are almost oblivious to his 'craft'. Time will tell if he has stopped this tactic or does he deserve another chance. He is a great footballer, but that part of his game saddens me! I only hope young Harit stops his occasional similar ideas. I really don't care who they play for or how great guys they are off the pitch I can never get used to accepting it as part of play and Gomez has been the best at it! First you say he did not score any goals and now you say that he did score them but most of them were cheated? You can like Gomez or not but he is surely not at all known for cheating, diving or whatever. Sorry if you have the idea that I think all his goals were wrong. He was one of the best strikers when he was young, but he had the bad habit of pretending to be fouled to get an advantage. Lots of players do but he did it often in the penalty box. When he went to Italy the local papers were full of such stories and the refs watched him and often when he was correct they did not believe it - his scoring record and his confidence was shattered. After Italy his loan period in Turkey was back to great results - the refs there have a different approach to the game. Since coming 'home' he has been occasionally back to his best, but there is still this 'must be watched' approach from senior referees - younger ones are not used to it so sometimes he is fine, but he still appeals as if he has been badly assaulted when no contact has been made. Perhaps a new chapter at Stuttgart! I hope he takes the chance - he is really much better than that part of his reputation. 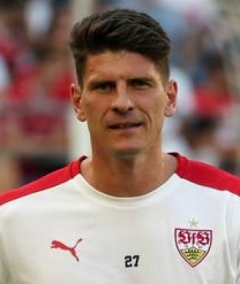 I always thought that Mario Gomez was hugely underrated, he was never world-class but knows where the goal is and will improve Stuttgart without a doubt. Just seen the pics of Mario and team arriving in Spain for their break - he looks fit and happy and ready to go! Really hope it works out for him and he respects the chance he has been given.